The Eradicator Race – Carbon Innegra SUP will take your Stand Up Paddling experience to a whole new level. This Stand Up Paddle Board by Boardworks was designed for stability, versatility, performance, and speed and it can be used by novice, intermediate or advanced level paddlers alike. Even though it can be used by less experienced paddlers, experts and professional racers will really feel at home on this board. 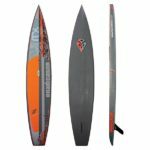 It can perform well and excel in different conditions, from flatwater to surfing, downwind, ocean race and even in glassy and choppy water conditions. It features a flat rocker for speed and a flat bottom for an easy water release. It is one of the more expensive boards, but it makes up for it with durability, versatility, and performance. All in all, the Carbon Innegra is one of the best boards you can buy, and a 14′ version is also available. The Eradicator Carbon Innegra has a smooth and simple layout. It features a low rocker with clean lines which gives a super smooth and easy glide and feeling on the water. It also has ample volume and width that can endure any water conditions. Its 246/286 liters of volume is already enough for most to float racers without having to sacrifice stability, speed, and performance. The Eradicator can hold its own surf, and it works well with any water conditions you want to take it up with. Designed for the elite and the recreational surf racers alike, this Paddle Board is a great choice for anyone who is looking to improve and to take their paddling abilities to the next level. The Eradicator is an ultra-fast, and a very versatile race stand up paddleboard. It can be used by both professional and recreational surfers. It makes for a stable glide with ease through still or rough waters. It has volume and width that is enough to float surf racers while still being able to give a fast, stable and impressive performance. This is a soft and fast surfboard that is fun and easy to use. The hull dis designed for ultimate speed and versatility. Its fairly flat rocker is designed for speed, and it has a flat bottom with a V off its tail for an easy water release. It has a slightly recessed cockpit for a lower center of gravity and allows for easy foot movement. The low entry rocker was designed for it to work extremely well on flatwater, it has a self-regulating vent plug, and the single race fin was configured for speed and tracking. This paddleboard is very light and has a LiftSUP handle meant for running beach starts and also for easy transportation and locking. It may be a bit expensive, but with the performance, speed, stability, and versatility of the Eradicator Carbon Innegra, it is totally worth it. It can be pretty much used by any surfer, may that be novice, intermediate, professional, elite or recreational race surfers. It has a great looking design, and it performs well in any water condition. 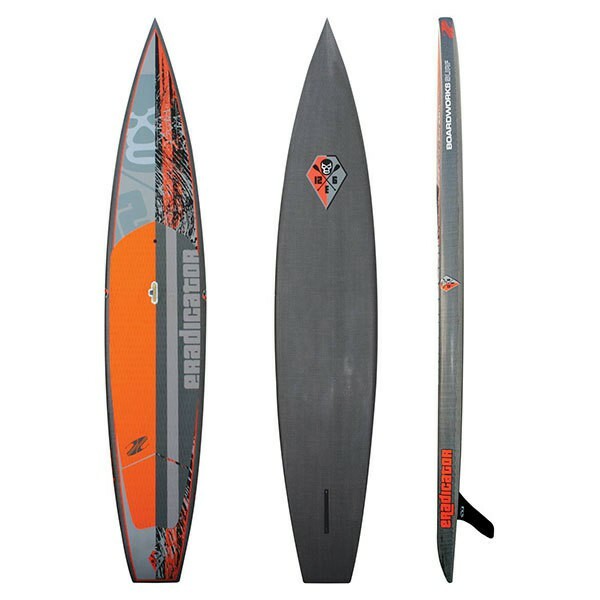 Try Boardworks’ Eradicator Carbon Innegra for a smooth, fun and an all-new surfing experience.